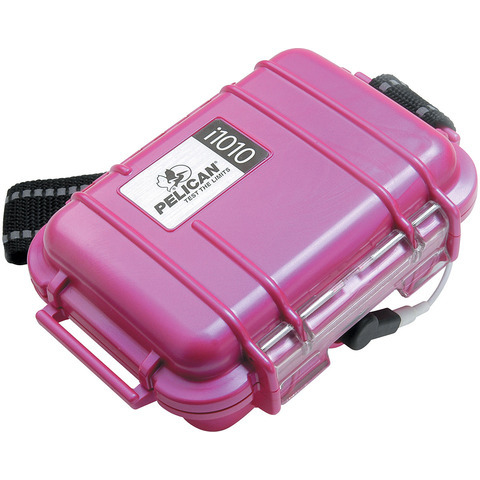 Designed for any iPod Nano and Shuffle, the i1010 Pelican Case is waterproof, crushproof, and dust proof. Polycarbonate body, stainless-steel hardware with a strong nylon strap. Custom rubber liner doubles as o-ring seal to protect while you play. Stores earphones, USB or firewire cables. Easy open latch. Unconditional lifetime guarantee of excellence. Exterior dimensions: 5.43" x 4.06" x 2.12". Interior: 4.37" x 2.87" x 1.68"
Lid depth 0.69". Bottom: 0.94". Total: 1.63". Buoyancy 0.51 lbs.